The manga and its audiovisual counterpart, anime, have been a constant source of inspiration for the Takashi Miike universe. They have been the starting point of rather dispensable subproducts like Waru, modest entertainments like Silver, or masterpieces such as Ichi The Killer. One could say, in fact, that the Miike trademark most cited by Western critics, the hyperbole to the limits of absurdity, is the result of a brave and radical-as-ever transposition of manga’s expressive effects to live-action films. At least where form is concerned. Miike films of the 1990s and even early 2000s like the aforementioned Silver and other similar productions were the ideal cropland for the development of Miike's iconoclastic cartoonism. These were movies with rudimentary scripts, pure pretext for spectacle and often adapted from comics, that eventually constituted style exercises and testings more than anything else. When the director immersed himself in more substantial adventures, those testings bore their richest fruits and the cartoonism acquired its deepest expressive force, to the point of providing the most memorable moments of films like Dead or Alive I and II, Ichi the Killer, Graveyard of Honour or Visitor Q, among many others. Sometimes the film-as-a-style-exercise scheme would reach the notable and self-sufficient dimensions of Full Metal Yakuza or, in its more evolved and refined version, Sukiyaki Western Django. The film under review here, Ninja Kids!! !, is the most baroque and hyper-saturated result so far of this flesh-and-bone rendering of the anime sources that characterize the work of this Japanese director. But it's also more than that. 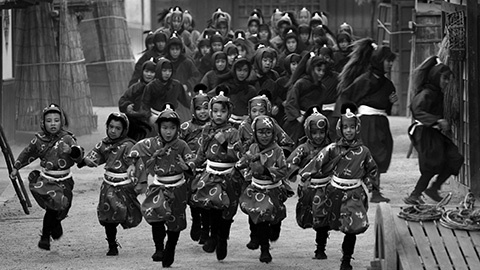 If one was forced to divide Miike's work to date into stages, one possibility would be the following: an initial and mercenary first stage of V-cinema virtually forgotten, a second stage formed by both V-cinema productions and theatrical releases in which the singular and unconscious authorship of the director is forged (a stage in which many say his best works can be found) and a third mainstream, high-budgeted, auteur-conscious stage (the current stage in which the films of these last years are inscribed), where the proportion of original scripts versus comic-books adaptations and remakes is clearly inclined, more than before, toward the latter. I wouldn't dare point out where exactly the boundary between the second and third stage lies. The transition from one to another has been rather organic, and some productions are clearly placed between the two. Among the critics that have been following Miike's career for a while and among the most cinephile section of his followers, there seems to be today a certain nostalgia for the second stage. In a master class at the 2013 Sitges Film Festival, within the framework of a global tribute to his career, a reporter asked the filmmaker whether the greater formal classicism of his last films was due to the fact of managing higher budgets or to having matured as a director. Unfortunately, and maybe due to some mistake in the simultaneous translation, Miike did not understand that the classicism mentioned in the question referred to the formal aspect of his films and not the content, and answered that while almost all of his films released in the West are films with a great display of violence, in Japan, since the beginning of his career, he also made many movies without any violence or with a rather low presence of it. He therefore stated that in that sense - that of the content and specifically the violent content - there has been no change at all in his filmography. The question, however, was of a different nature and could be paraphrased as follows: where is the most cinematically innovative and experimental Miike, the one who brought us scenes for the annals of film history such as the simultaneous mixing of up to three timelines intertwined in the same space and with the same characters, without ever indicating to the viewer the time jumps, and even cutting from the shot in one timeline to a reverse shot in another one, as in Ichi the Killer (the scene where Kaneko invites Ichi to eat noodles)? Or, where is the Miike who built the last minutes of Audition mixing memories and hallucinations through unforgettable editing choices, the one who summed up the whole routine of The Bird People in China's main character in a succession of fast motion sequences during the first minutes of the film, the one who made an entire film, Gozu, as a huge metaphor for sexual insecurity, or the one who started Big Bang Love, Juvenile A with an existential dance preface that makes way to a work where every element acquires a powerful symbolism, from the sun ray that causes Ryuhei Matsuda's heart to bleed or the butterfly flying around for the whole movie until it dies electrified, to the rocket and the pyramid that make the leading couple wonder whether they’d prefer to go to heaven or space? The list of examples is endless. Well, ridiculous as it may seem, this form-experimenter Miike can be found today not in his praised remakes of classical chanbara or in any of his other recent adult-oriented films, but in films like Ninja Kids!!!. 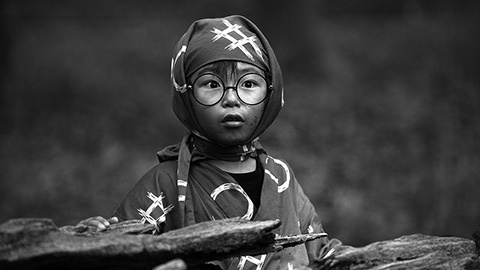 Some may feel disappointed that the greatest efforts of formal innovation by the Japanese filmmaker are today applied to an absurdist action comedy for children, but that is where he has actually placed them. Trying to figure out why would take too long, but I'd like to posit a hypothesis very briefly: Miike's formal innovation was always the result of his absolute freedom as a director who doesn’t need to account for anything to anyone. From the moment important festivals begin to pay homage to his career, his films are selected for Cannes or Venice and praised as auteur cinema, and serious book-length studies of his work are published, the director becomes aware of his authorship and starts making his new works with that self-consciousness. This, together perhaps with the management of higher budgets, may be the cause of more formal restraint (not classicism, as a matter of fact). Some of his later films, such as Lesson of the Evil, though not reaching the heights of yesterday, still present remarkable formal choices. 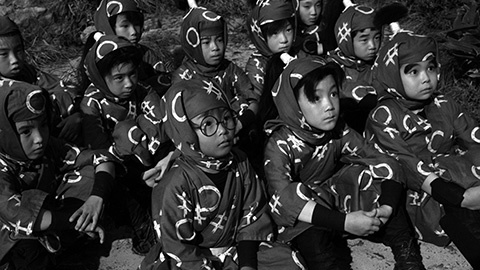 However, in a family-oriented production adapted from a manga that itself is full of absurd humor, which a priori is not likely to be in the crosshairs of intellectual criticism, maybe the director feels as free and unconcerned as in the old days – allowing him to unleash all his formal creativity without restraint or self-censorship. It is not necessary to go into the details of the Ninja Kids!!! storyline. Miike and screenwriter Yoshio Urasawa abandon any effort to follow a conventional narrative structure, making the film an uninterrupted and vertiginous parade of comically absurd situations in which the end, laughter, always justifies the means. In fact, the main plot of the movie, in which objectives for the characters are clearly defined, does not begin until two thirds of the film have passed. There is room instead for mentioning that the film starts as a truly faithful adaptation of the manga/anime it springs from. 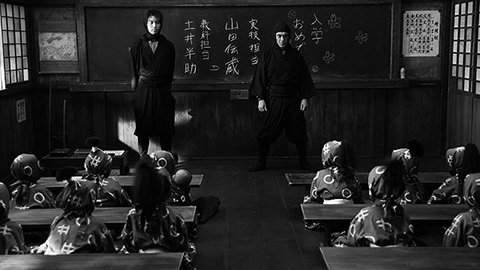 The introduction to the film is directly inspired by the original one, tracing many of its gags, such as the mountain climbing joke, the presentation of the teachers or the absurd situations that take place during the initial lectures of first-grade ninja students. Some shots are indeed almost identical, though adapted to the widescreen format. The director and the screenwriter even allow themselves a few nods to connoisseurs of the series, showing the consequences of certain original gags but not the causes. One example is the scene in which Shimbei, the funniest among protagonist Rantaro’s classmates, appears in class with an enormous head covered with a kimono, without having shown why, how or when this peculiar phenomenon occurred. The director's creativity shines in all its splendor in the many stylistic devices that stand out throughout the movie. First, we could mention the high level of character interaction with the FX additions. The characters see and interact with the foldout parchments bursting in to explain ninja weapons and techniques, or with other fanciful pop-up elements (Shina-sensei's floating head to which all the pupils in class pay attention, although being a representation of Rantaro's mind, for instance). Many explanatory intertitles are also brought into scenes by the characters with a gesture of their hands. The most radical example of this type of resource is the first appearance of Konnamon-sensei, the ninja trivia commentator, who brutally interrupts a scene tearing up the shot's background as if it were a wallpaper, causing a character to fall to the ground. Once he has explained the operation of the “sleeve shot”, Konnamon-sensei asks the characters to reconstruct the background with adhesive tape before they carry on with the scene. The characters nod patiently and do as ordered: the shot's background is reconstituted with pieces of tape that stay visible and the scene is resumed where it was left off. With this and many other gags in the same line, Miike takes his particular absurd humor to its most metacinematographic expression and offers some of the most original ruptures of the fourth wall we’ve seen in recent cinema. This should be added to the radicalized real action anime-isation already mentioned, which in Ninja Kids!!! becomes the main stylistic device. On this occasion we have the use of prosthesis that provide the actors with excessive cheeks, protuberant chins or colossal bald heads, the recreation of Shimbei's classical snotty-nose effect or the protrusion of enormous red bumps on the heads of the characters after they are hit. In that sense there is an unforgettable shot of a group of ninja antagonists in which each of them gets to have up to ten bumps on the head. That is a shot, like many others in his career, in which the essence of Miike's filmmaking is lucidly condensed. However, the aesthetically most remarkable manga-inspired aspect of the film is the repeated use of colourful, abstract and dynamic backgrounds that are so characteristic of the comic-book format (see, for example, the instant when Takamaru-san pounces on his adversary to cut his hair). The film also features many style resources recurrent in Miike's filmography which are today easily recognizable. We could mention the contrived aestheticism with which he builds a colourful alternative universe full of familiar leitmotifs: splendid cherry trees and overly lyrical skies, the elaboration of magical textures by means of, for example, surreal petal rains (even indoors) or the saturation of fireflies in the air (in the line of the highly original phosphorescent rain in MPD Psycho or the snowflakes in Hara-kiri: Death of a Samurai). The director's touch can also be observed in the fact that there is no scene which doesn't end with a spectacular action gag, in the always amazing and inventive repertoire of absurd humor, and in the scatological humor so characteristic of the director that even here makes its appearance once or twice. Beyond all this, however, Ninja Kids!!! stands as what ultimately all Takashi Miike films are: a passionate and carefree celebration of filmmaking itself. The movie credits are livened up by a series of making-of images in which we see the entire cast and crew immersed in the fun of materializing the crazy scenes that form this film. It makes one inevitably think of the lovable making of The Happiness of the Katakuris, a major work from 2001, one of the most prolific years in Miike's production both qualitative and quantitatively. The expressions of happiness that we saw in that making-of are essentially the same as those present in the credits of Ninja Kids!!! Many things can change in Miike's films, but something definitely remains unchanged over the years: cinema as an act of joy above all.